Which Pool Deck Material is Right for You? Installing a pool means more decisions than just the basin itself. People will spend as much time at the area around the pool as they will swimming in it. This means that choosing the right decking or patio material for your pool deck is a big decision. Here are some of the options that are available to you and the pros can cons for choosing them. Poured concrete is a traditional finish for many pool decks. It was inexpensive and relatively easy to maintain. Concrete has fallen out of favor recently, as it can be hot to walk on with bare feet and it also can crack when exposed to changing weather conditions. Still, it is an inexpensive option and can be tinted with many colors or even stamped or have accent bands added for an individual touch. Wood is a popular decking choice for backyards with or without pools. Wood can be built up around your pool and can be made into any shape or size to fit your needs. It can get slippery when it gets wet, however, so swimmers will need to be careful. Wood is also rather high maintenance. It needs frequently restained and refinished. It can be bought in a variety of types, and many exotic hardwoods can add a unique look to your pool area. Composite decking gives you the look and feel of wood with much less maintenance. Composite decks are typically wooden boards wrapped in a coating that will stand up to the elements. It can be coated with gripping paint to hold on to wet feet and does not need to be constantly refinished. Composite decks can be expensive, however, and the color choices are limited unless you paint. Paving stones are large concrete slabs that come in a wide variety of shapes and sizes. They are placed as individual pieces, so it gives them plenty of room to move around with the weather to prevent cracking. Pavers can be bought in most colors and give you the freedom to choose two or three different colors to create patterns of your choosing. Similar to paving stones, these small clay alternatives can give a unique southwestern look to your pool area. They are small and put down like any other tile, so some extra work to build a bed for them will be needed for stability. A similar effect can be created with thin stone. This may seem like an odd one, but if you think about it, rubber makes an ideal pool deck surface. Rubber is non-slip, durable and easy to clean up. A few companies are offering rubber pool decking materials that is similar to playground surfacing. It can be made in any design or pattern and comes in a variety of colors. Whatever you choose, Tampa Bay Pools can help. 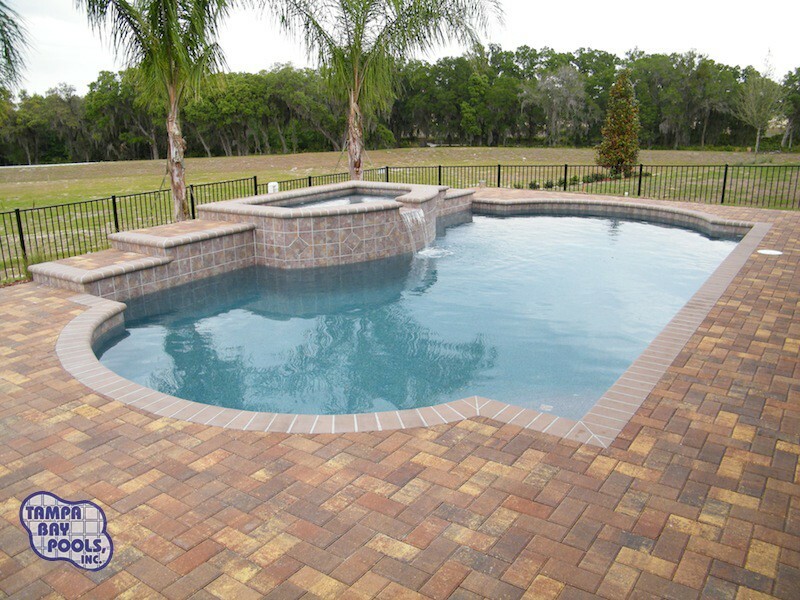 Check out our different options for your new pool, including pool deck materials and contact us today!